First Esquire magazine declares The Slowdown the best indie-rock club in the country. Then, NPR calls Omaha — particularly that area around the Slowdown — cool. OK, so the NPR blog is thinly reported, and typical “Look! They have culture in the boring Midwest,” but still, we’ll take it, right? 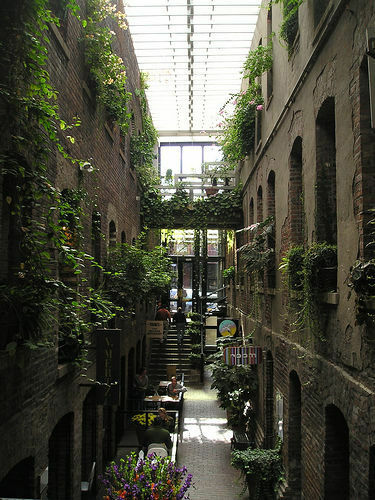 Downtown Omaha is actually much more hip than downtown Fargo — the Old Market is probably my favorite place in Nebraska, so far. I love driving up for a meal at a place like La Buvette (even though once when we were there a wine bottle literally exploded and injured a customer) and then strolling around the shops (like Jackson Street Booksellers and the awesome Flying Worm), shopping for whatever I forgot at Patrick’s Market (the cutest little grocery store ever) and staying the night at the Italian-style Magnolia Hotel (if I were getting married, I’d have the ceremony in the courtyard). Oh, and buzzing over to Urban Outfitters and Ruth Sokolof Theater (that arthouse theater near the Slowdown) for a movie. That’s a great day trip. A few years ago, I did a story about Old Market, and also wrote an accompanying column about how the Old Market is better than the Haymarket. However, the features editor spiked the column — apparently thinking Lincolnites would not tolerate that kind of heresy. But let’s face it: It is better. Mainly because they have critical mass: There are lots of destination points that draw you into Old Market; not as many in the Haymarket. But the good news is the Haymarket certainly has the potential to be just as hip as the Old Market. We’ve got a good start — with places like Maggie’s and Ivanna Cone and Bread & Cup. If I could wave a magic wand, I’d move Stella (a boutique), the Black Market and Tsuru into the Haymarket — and then open my own little recycled, reused and repurposed furniture store in the middle of it all. However, from what I’ve read, the Old Market got where it is today not by government dictating development — it happened organically, through individuals. We’ve got some individuals trying to make things happen in the Haymarket now — chiefly, those WRK twins, Robert and Will Scott. Although they’ve lured more chain restaurants than I’d prefer (Noodles & Co., Panera, Qdoba), they are definitely changing the landscape of downtown Lincoln. They are also guiding development near the arena — it’ll be interesting to see what they bring there. Will an Urban Outfitters be next to the Haymarket? An awesome little grocery store like Patrick’s? The mayor has mentioned Kansas City’s Power & Light District as a model for the area near the area (although other city officials later downplayed the comparison). Time will tell. Kansas City's Power & Light District -- a shopping district near the Sprint Center that Lincoln officials have cited as an example of the private development that will spring up near Lincoln's new arena. be a model to follow. However, the powers in Lincoln always think they have the answers which over the years have become ingrown. I suppose it is always possible things will change but I wouldn’t bet on it. 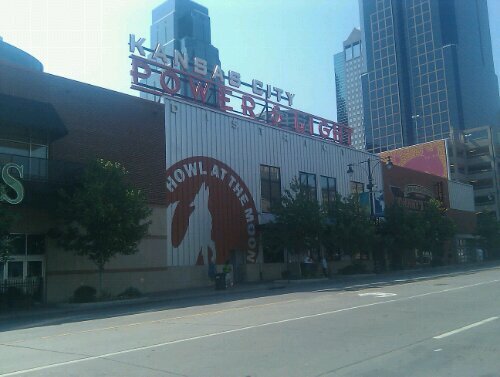 Kansas City’s Power and Light District is very COOL…except for the fact that the burger joint..can’t remember the name (Think Brewsky’s) took down the Husker banner yet still had Colorado’s hanging up. There is also a semi-open air stage right across the street from the Sprint Center that had some amazing bands playing..all for free I will add..the last time I was down there.